My Diana+ camera arrived yesterday. I haven't had time to run a roll through it yet, but I will try to do that this weekend. It comes with a book of images (hardbound), a small instruction pamphlet, and a couple of plastic inserts. Without the inserts, it shoots 6x6 negs like the Holga. One insert crops the neg down to 4.2x4.2cm, like the original Diana camera. The 2nd mask is for panoramas. The mask allows you to shoot panoramas by allowing a little overlap with each frame. Attached to one of the neck-strap lugs is a little plastic insert (on the left of the camera in my photo), which is for holding the shutter open for long exposures. It's a very nice little camera, that looks and feels like a Diana camera original. I plan to compare it to it's inspiration, the original Diana camera, and also to the camera it is closer in comparison to, the Holga camera. The Proper Care and Feeding of your Diana - Diana camera user's guide. Note: When I first wrote this post, the Lomography Diana+ hadn't quite hit the scene. These notes apply to vintage Diana and her clones. What is this all about? If you have seen a photographer with a Diana camera, then you already know, the camera is less than light tight. Their cameras look like tape magnets. You need to use a little black masking tape here and there to prevent fogging of your film. Don't use electrical tape, it's way too sticky and will gum up everything. Ditto for duct tape. I like using black matte masking tape. There are a few things that need to be done to shoot with a Diana. If your Diana has the film clip wings, these need to be lightly taped with 2 or 3 winds of masking tape to provide sufficient friction to maintain film tension and prevent the roll from winding loosely. A loosely wound roll will ruin a roll of film with heavy flashing on the edges of the roll. The looseness of the wind allows light to leak to film edges. If your camera does not have these clips, but have a small nib on the camera back which is supposed to hold the roll, you can place a small piece of cardboard, such as on of the flaps of the box your film came in, folded over once and place it under the film spool on both take up and film spools. If you received your camera in mint or unused condition, it will have a factory made take up spool. Throw it away! These were often made from the plastic scraps from the factory. I imagine the plastic was made from scraps swept off the floor. They do not fit well. The slop in the width between the top and bottom spool cap can allow light leakage. I’ve also seen original spools that were made that were slightly transparent. If you remove your exposed roll using one of these, chances are that your precious first images will be badly fogged. If you have a pro-lab (one that processes 120 film) near you, ask if they would be so kind as to give you a 120 spool. If you can’t find a willing lab and live in the USA, email me, and I will mail you one. The cost to you will be a postcard of one of your images. Load the camera in the shade, never in direct sunlight. If you can’t find any shade, turn your body so that it shades the camera as you load it. Take the empty film spool out of the camera. Thread the leader end of the new roll to the takeup spool. Wind the film around the spool a little before putting it back in the camera. If your model camera does not have the film clip wings, it’s a little trickier getting the camera back closed if you are using cardboard to maintain film tension. Take a deep breath and go slow. 3. Taping up the camera. Some people like the light leaks the Diana camera produces. I don’t, so I tape up my camera with ¾ inch black masking tape I pick up at my photo store. This is the order in which I apply my masking tape. In all cases, I fold over the end of the tape to create a ¼”-1/2” tab in order to remove and replace the tape easily. I am usually able to use the tape 3-4 times before needing to replace it. The lengths are approximate and only to give you an idea of how long they are. A. 2” strip, applied to the lock-unlock lever. The purpose of the tape here is two-fold. It prevents the camera from accidently opening, and it also will prevent a light leak. I once had a Diana with semi-transparent plastic in this area that allowed much light leakage. B. 3-1/2” strip applied to left and right side seams. The tape starts just under the camera strap loops and wraps around under the camera. C. 6-1/4” strip applied across the back top seam. Again it starts under the camera strap loop, and comes across the back of the camera and around the side, stopping under the opposite camera strap loop. D. 6-1/4” strip applied across the bottom from seam. The tape is applied across the front, then folded over to the bottom of the camera. E. 2” strip applied over the film counter window. This is removed to advance the film, then replaced. F. This is if your camera has one: 2” strip of tape over the I/B shutter selector on the lens barrel. G. This is if your camera has one: 2” strip of tape over the aperture selector on the lens barrel. This strip of tape will also prevent the lever from changing accidentally. The lever tends to be a little loose. How about the Holga? It's a lot tighter than a Diana, but still needs a few precautions. Mostly, make sure the film counter window is covered in bright sunlight, and that the back is securely fastened. The Diana Camera is camera zero. This is the camera that began the plastic toy camera revolution back in the late 60’s and early 70’s. The story is told that instructors at Ohio State University began using the simple camera as a tool to teach photography. Many of the photographers who used the Diana, appreciated the soft surreal images the camera produced. The camera, produced as a novelty premium for gas stations, pizza parlors and the like, was already out of production when this generation of photographers began using the camera. There were cameras being made that looked like the Diana, but with different nameplates and even cheaper and flimsier construction than the original. These copies are referred to as clones. Photographers looking for the Diana and Diana clones had to scour yard sales and thrift stores to fill their needs. I found my first Diana clone in a thrift store. I paid what I thought at the time to be an exorbitant sum of $5 for a Windsor. With the advent of eBay, finding the cameras became even easier, but demand continued to soar. 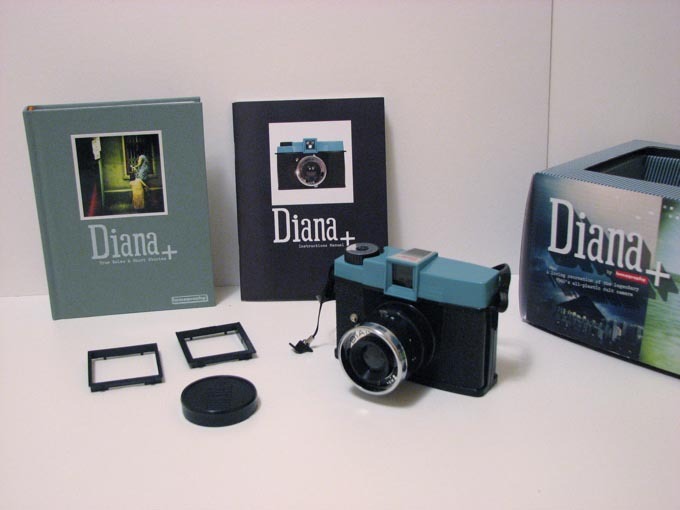 At its height, Diana cameras, mint in their original box were selling for upwards of $200. The Holga, a cheaply made Chinese camera came to fill the void of an ever-dwindling supply of plastic Diana cameras. Photography became a popular pastime in China, and the Holga became the means to fill the demand. It is a happy coincidence that this camera takes photos with a similar characteristic vignette and in and out of focus image parts as the Diana. In the U.S.A, it was originally used and sold through the Maine Photographic Workshops. The Lomo Diana+ (Diana Plus) was born in 2007. It is a Diana copy with improvements. It seeks to capitalize on the Diana mystique. This camera not only offers the picture taking capabilities of the Diana camera, but also features a removable lens to convert the camera into a pinhole camera. I have yet to test this camera to see if it is a worthy successor to the original Diana. Mine is on order, and when I finally get my hands on it, I will report on its capabilities. I’m not sure if the toy camera “fad” has died down, or if the appearance of the Diana Plus has driven down the price of a Diana camera or a clone, but a recent check of prices on eBay’s shows them to be much more reasonably priced.